The Beast from the Yeast Bears Fruit! We know it's been a long time in the works, but after several months of having a smarter, more scientifically trained friend of ours help clean up and isolate viable strains from within the miasma of critters we collected here in Saxapahaw last February (of which we posted a follow-up a few months later), we're finally ready to update everyone on some of the (so far, at least) rewarding results of our wild yeast collection project. to the point we had about X billion cells. Since last we checked in with an update, our resident yeast wrangler pulled the four samples we handed over and worked her magic on them, streaking plates and isolating individual colonies of yeast and other organisms. After running DNA sequences and identifying the most promising cells, she grew up single-cell colonies and created "pitchable" quantities for us to use in a few small test batches. When everything was ready, we met one Sunday morning over breakfast in Chapel Hill (at Breadmen's on Rosemary Street—their corned beef hash is second only to the General Store here in Saxapahaw), where we acquired a cooler of our samples, all organized neatly in small flasks (and backed up by slants and single-colony petri dishes). So as to gather as much information as possible, we took the notes that accompanied the yeast samples and dug around online a bit to find out what potential characteristics each of the three samples might exhibit, once we pitched them into viable wort. • Schizosaccharomyces Japonicus (Sample 1315): Commonly found in nature on the surface of strawberries. • Debaryomyces Hansenii (Sample 1318): Primarily found in cheese, with a high tolerance for salinity, of all things. • Candida Zeylanoida: Found in our samples, but never prepared as a sample, since it's a documented human pathogen. • Various other yeasts, molds & bacteria: Everything else in there was either dangerous or not worth exploring for beer fermentation. So a couple of months ago, we brewed a 10-gallon batch of our normal Rusted Plow Farmhouse Saison wort, which is a fairly simple combination of Belgian Pilsner, Wheat & Acidulated malt (to help bring down the pH to the proper levels during the mash) and a few traditional European hop additions with a starting gravity on the lower side (around 10ºP). 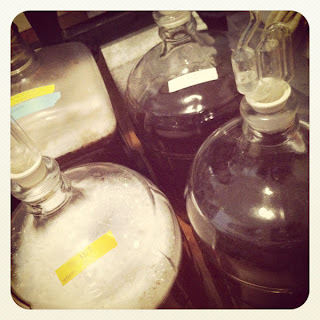 We split the batch into four 3-gallon carboys, and then pitched about 120 billion cells of each strain into each of the carboys, retaining the fourth as a "control" of sorts by pitching a "normal" saison yeast (WLP565). We pitched around 66F and let the fermentation temps rise slightly to around 70F-72F for the entire span of fermentation, since we do the same with most of our other normal Belgian fermentation schedules (not a personal fan of ramping up temps into the 80s and 90s to achieve "ester-bomb" saisons, but that's just me...). to allow the yeast's flavor and aroma characteristics to shine. 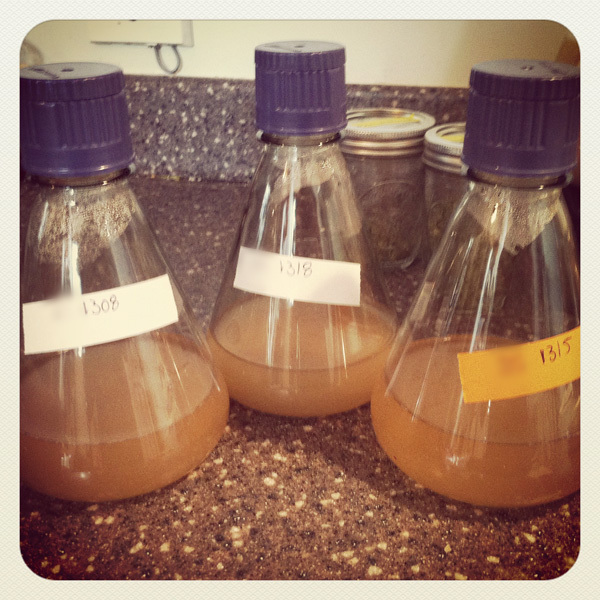 Want to know how each of the sample fermentations turned out, and what we've done with the yeast since then? We'll post test-batch results within the next week or two, and fill you in on which strains performed beautifully and which one turned out to smell (and kinda taste) like sweaty gymsocks and really good cheese (but not in a really good way). Stay tuned!